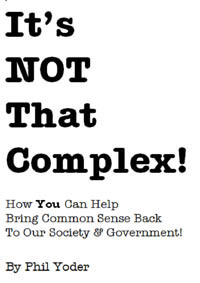 ﻿ It's NOT That Complex! Dedicated to the belief that common sense, ethical behavior, and new individual initiatives are required for our society to survive. This book is a commentary on various trends and topics observed within our culture and society that need serious thought and discussion. Read it in paperback form or on your e-book reader and see if you agree!